36 monthly payments of $27.78 per $1,000 financed, with approved credit. No security deposit required. Offers require credit approval through Ally Financial. Or 36-month lease with $2,878 due at signing. No security deposit required. Both options price is plus sales tax, $184.00 private tag agency fee and titling, any dealer installed accessories and dealer service fee of $899, which represents cost and profits to the selling dealer for items such as cleaning, inspecting, adjusting new vehicles and preparing documents related to the sale. See dealer for details. Offers expire 4/30/19. The new Toyota Corolla offers drivers a variety of options for a lively drive through High Springs, Lake City and Gainesville, FL. The new compact car provides a standard 1.8L engine and an available 1.8L 4-cylinder with Valvematic technology that manages an EPA-estimated 40 highway MPG. It also offers advanced safety technology with standard Toyota Safety Sense™ P. The driver-assist suite includes Lane Departure Alert with Steering Assist, Automatic High Beams and more. In the event of collision, passengers are surrounded by high-tensile-strength steel body panels, front and rear energy-absorbing crumple zones, side-impact door beams and more. There’s plenty of variety, including 6 trim levels – the L, LE, LE Eco, XLE, SE and XSE. 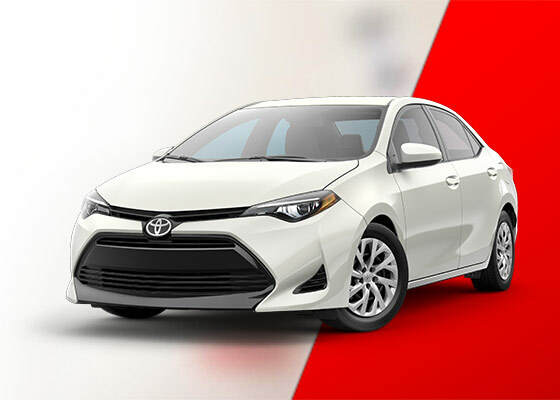 Test-drive the new Toyota Corolla today at Rountree Moore Toyota, serving High Springs, Lake City and Gainesville, FL. 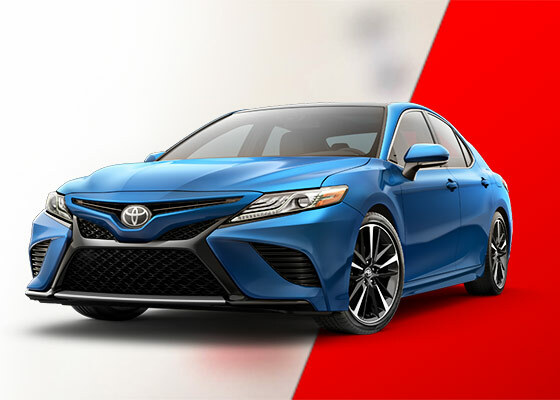 The new Toyota Camry sets itself apart from other mid-size sedans with a suite of standard driver-assist technology – Toyota Safety Sense™ P. With this feature, drivers are provided with Pre-Collision System with Pedestrian Detection, Dynamic Radar Cruise Control and more. The Toyota Camry offers new performance options as well. Car-buyers can choose between a standard 2.5L Dynamic Force 4-cylinder engine that achieves an EPA-estimated 41 highway MPG or a powerful 3.5L V6 that kicks out 301 horsepower. Explore 7 trim levels – the L, LE, SE, XLE, XLE V6, XSE and SXE V6 – as well as 3 hybrid models. Drivers in Gainesville, High Springs and Lake City, FL can find the new Toyota Camry today at Rountree Moore Toyota. Lease for 36 months with $3,538 due at signing, with approved credit. Price is plus sales tax, $184.00 private tag agency fee and titling, any dealer installed accessories and dealer service fee of $899, which represents cost and profits to the selling dealer for items such as cleaning, inspecting, adjusting new vehicles and preparing documents related to the sale. 12,000 miles per year and $0.18 per mile over. No security deposit required. See dealer for details. Offers expire 4/30/19. Utility and efficiency rolled into one. Drivers in Lake City, Gainesville and High Springs, FL can find the new Toyota RAV4 at Rountree Moore Toyota. The compact SUV offers 73.4 cubic feet of cargo space, along with versatile 60/40 split-folding rear row seats and a foot-activated power liftgate, making it equipped for all of your impromptu adventures. When you’re out on the road, take advantage of its 120V/100W power outlet for added convenience. Meanwhile, its 2.5L 4-cylinder provides 176 horsepower and premium fuel economy at an EPA-estimated 23/30 city/highway MPG. For commutes through the city, the Toyota RAV4 offers a 2.5L 4-cylinder ECVT hybrid engine as well, which achieves an EPA-estimated 34/30 city/highway MPG. Find it today in 6 trim levels – the LE, XLE, Adventure, SE, Limited and Platinum (LE, XLE, SE and Limited available with hybrid engine). 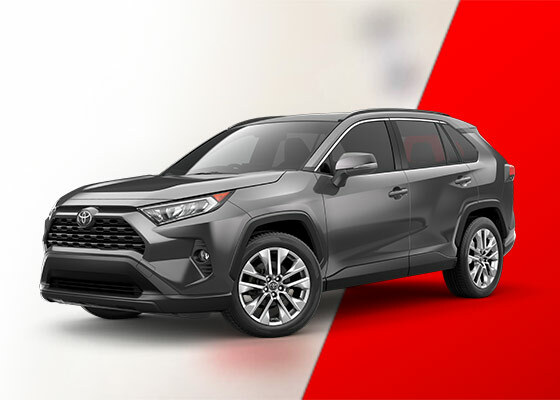 Test-drive the RAV4 at Rountree Moore Toyota. 36 monthly payments of $27.78 per $1,000 financed, with approved credit. No security deposit required. Offers require credit approval through Ally Financial. Or 36-month lease with $3,598 due at signing. No security deposit required. Both options price is plus sales tax, $184.00 private tag agency fee and titling, any dealer installed accessories and dealer service fee of $899, which represents cost and profits to the selling dealer for items such as cleaning, inspecting, adjusting new vehicles and preparing documents related to the sale. See dealer for details. Offers expire 4/30/19. 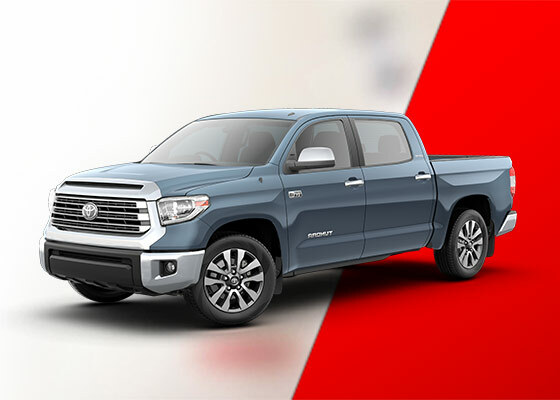 When you drive the 2019 Toyota Tundra, you have a force of nature on your side. With 2 engines to choose from, the 4.6L V8 with 310 HP and 327 lb.-ft. of torque or the 5.7L V8 with 381 HP and 401 lb.-ft. of torque, you’ll be hard-pressed to find a job tougher than your Tundra. It’s not all work and no play, either. The Tundra has a max towing capacity of over 10,000 lbs. so you can bring your favorite toys with you wherever your journey takes you.